Donovan Cook is the creator of 2 Stupid Dogs, which aired on TBS and in syndication in 1993-95. It was then subsequently rerun on Cartoon Network where it gained following within animation fans. He has also worked at Disney, Spumco, and Klasky-Csupo. The phone interview took place on August 11, 2011. Where are you from? What were your influences? I'm from California. I grew up in northern California, then moved to southern California as a teenager. Influences, early on, were Disney cartoons, Warner Bros. cartoons and particularly a couple of Peanuts animated television specials. The Halloween special, the Christmas special. I loved those. Heavily influenced by those early on and Schulz in general. A little bit later, toward high school, obviously Calvin and Hobbes was huge for me back then. And you went to CalArts? Yeah, from '87 to '90. I made four films there. Generally in the character animation program at CalArts you make one film a year. I made a first year film, made a second year film. In the second year we started making some collaborative films, too. Made a couple of group films in the second and third year, but made terrible films the first couple of years. Last year I made my first film that was actually coherent. Got some laughs and things like that. I was in the same class with Pete Doctor, Ash Brannon, Chris Ure, Mark Kennedy. We were a great year. Great class. Did you made any acquintances with fellow students that you would work with on other shows? Oh sure. Quite a number of people from 2 Stupid Dogs were from CalArts. Craig McCracken, who art directed Stupid Dogs was a year, maybe two years behind my class. And Mike Moon, Genndy Tartakovsky, Rob Renzetti, Tony Craig. Almost all of us were from CalArts, right around the same time. Did you get a job in animation after graduation almost instantly? I was really fortunate. At the end of the second year I did an internship at Disney Feature Animation on Little Mermaid. At the end of my third year, which is when I graduated, I went back to Disney for a year. I left Disney to create 2 Stupid Dogs. You worked at Spumco on Ren & Stimpy? I did, yes. For a little while. I was at Spumco when all the really nasty stuff went down, when Nickelodeon shut it down. I left Disney, I was 22. I thought it would take me few months to sell Stupid Dogs. Ha ha. Took a year and a half. So in the meantime I did a few things and I was fortunate enough to meet John K. and spend some time there. 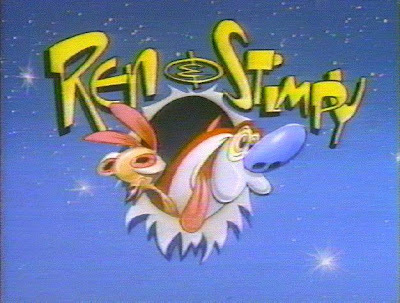 I had never done any television work before so my first lessons in how to make TV cartoons was at Spumco with John K. so that was a great time for me. I learned alot from John, and Ron Hughart was there. Ken Bruce and Dan Jeup were there at the time. Those guys were all there directing and I came in as an assistant director and really learned alot about television and how to keep it from getting too rough around the edges. But then all hell broke loose. Luckily that happened right around the time when we had just finalized the deal with Hanna-Barbera so the timing was okay. So I left Spumco and went directly to Hanna-Barbera to start working on Stupid Dogs. What did you do as an assistant director at Spumco? Spumco was a great place. They were very hands on. They did what's called character layouts. Once the storyboards were done you would make story reel, or what people now call an animatic, to time out with the storyboard and the dialogue tracks. And then instead of immediately shipping it out overseas they would do character layouts, where alot of really talented artists would do, not all the key poses you would use if you were to animate, but, say, if you were going to have a scene you were going to animate with it was going to have maybe twelve key poses, in the character layout you would probably do maybe four or five of those, the really, really key ones. And so as an assistant director I helped work with the directors in timing some of the character layouts and if something wasn't working I would do some fixes to it. So I was there as a second hand to some of the directors, dealing with timing and character poses and things of that nature. 2 Stupid Dogs (C) Hanna-Barbera Cartoons, Inc. The Cal Arts graduates of the time were really lucky. Cartoon Network was launched, which gave some of them an immediate long-term job opportunity.